Example of the flood/standing water product as generated by the GOES-R flood/standing water algorithm for MODIS on June 19, 2008. 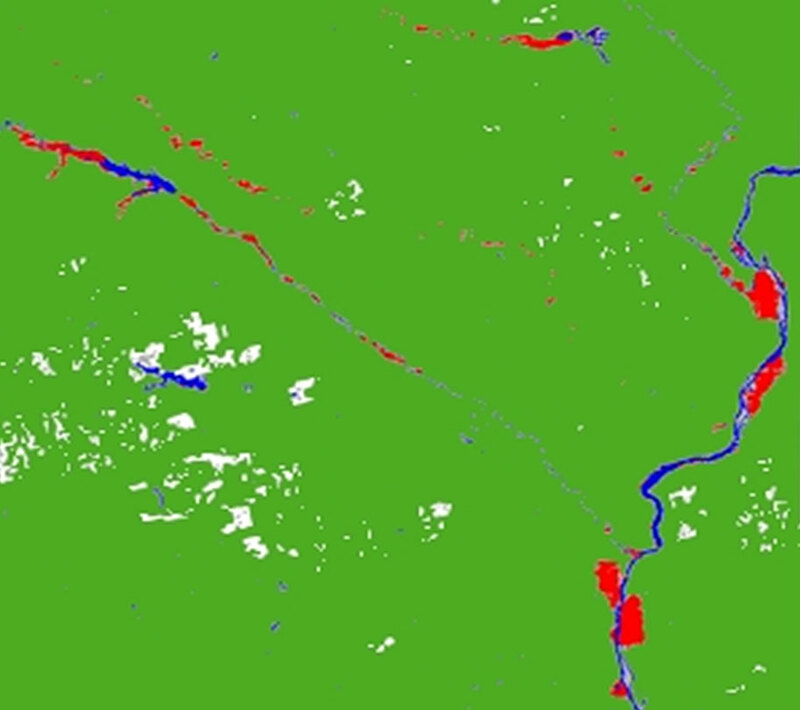 The original water body is shown in blue, flooded areas are shown in red, and land is shown in green. The flood and standing water algorithm will use the enhanced temporal and spatial resolution of the ABI to monitor the minute changes in outward extent of water bodies. Floods are usually disastrous events occurring in a short period of time. Forecasters will be able to easily identify areas where flood or standing waters are likely to be present. Weather and river forecasters will be able to use this information to issue critical flood warnings to help protect life, property, and agricultural interests. Precise mapping of the floods/standing water is also required for detecting deficiencies in existing flood control and for damage claims afterwards.